Barbara Elsmore continues our theme about Christmas decorations and the family memories they evoke. I was so pleased that Patricia reminded us of the joy of getting out the box of Christmas decorations and being re-acquainted once again with the treasures that lie within. 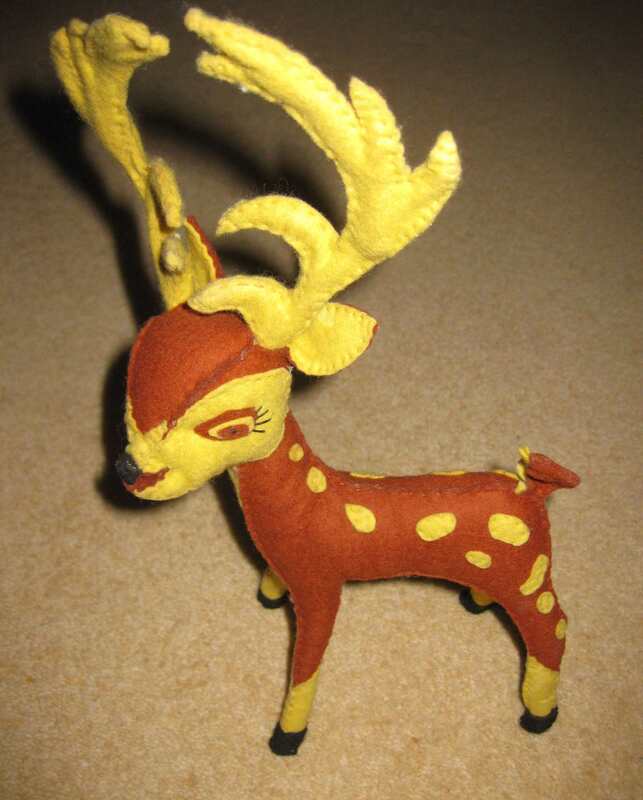 My personal collection of old favourites contains a ‘Bambi’ made in felt by my late mother in the 1970s from a pattern found in one of her magazines. My dad added a little wooden sledge and with a few special tiny parcels on it the whole thing was placed proudly in the middle of the sideboard. 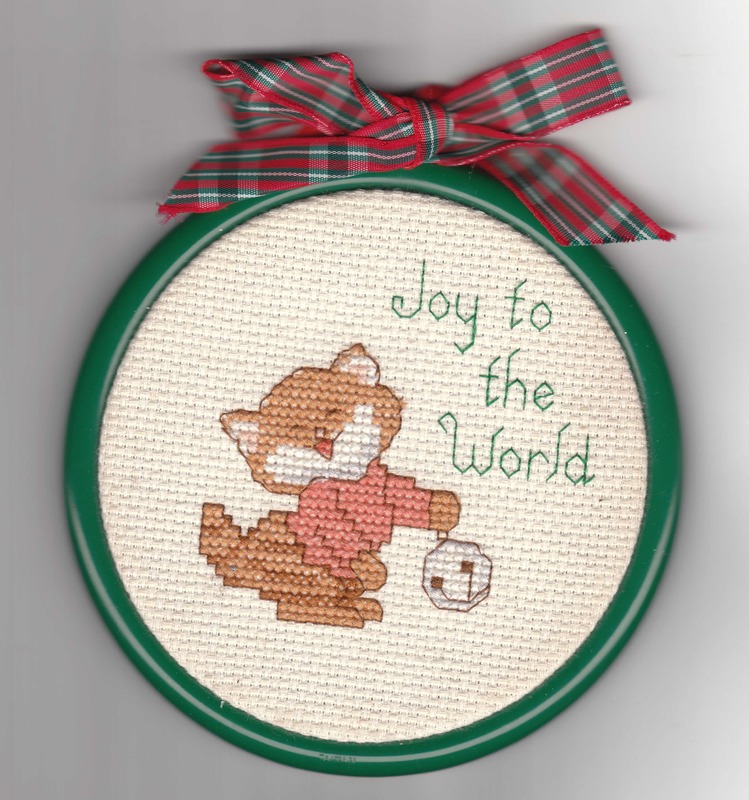 I have a later little cross stitch character made by my mother wishing us all ‘Joy to the World’ and because I can sense the American influence here I know she would have made this while staying with my brother and his family in the USA over Christmas. 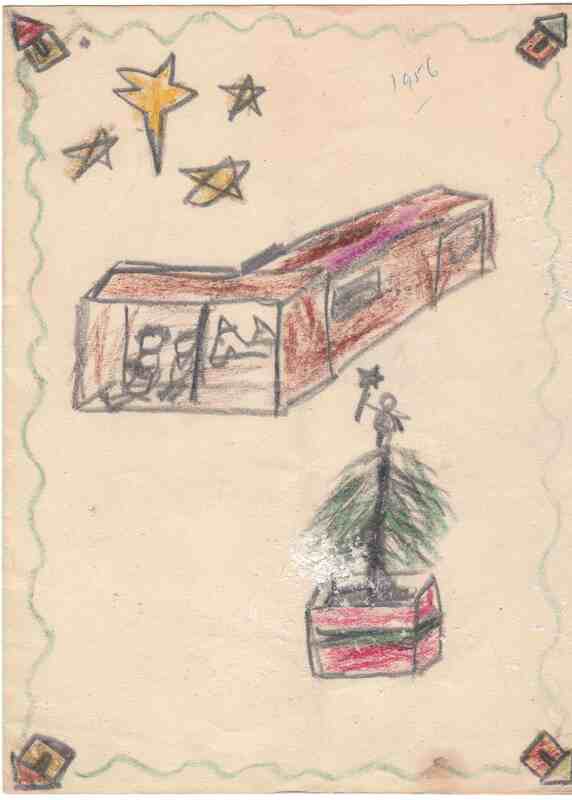 Somehow a Christmas card made by my brother when he was seven in 1956 has also found its way into the box. Christmas in our very practical household was always associated with ‘making’ something to add to the festivities and as children we were issued with card and paper and scissors and glue and as often as not there would be something in a magazine that we could copy. This practice reached its hiatus in my late teenage years when a Middle Eastern Christmas village scene was created out of empty cigarette packets, with little doors and windows cut into them, piled high on a cake board. The whole thing was then covered in a thick layer of polyfilla and tiny figures were made out of Fimo (newly arrived on the market) and added to the scene. The making of this little village was a real family affair with some members valiantly upping their nicotine quota to provide the empty cigarette packets! 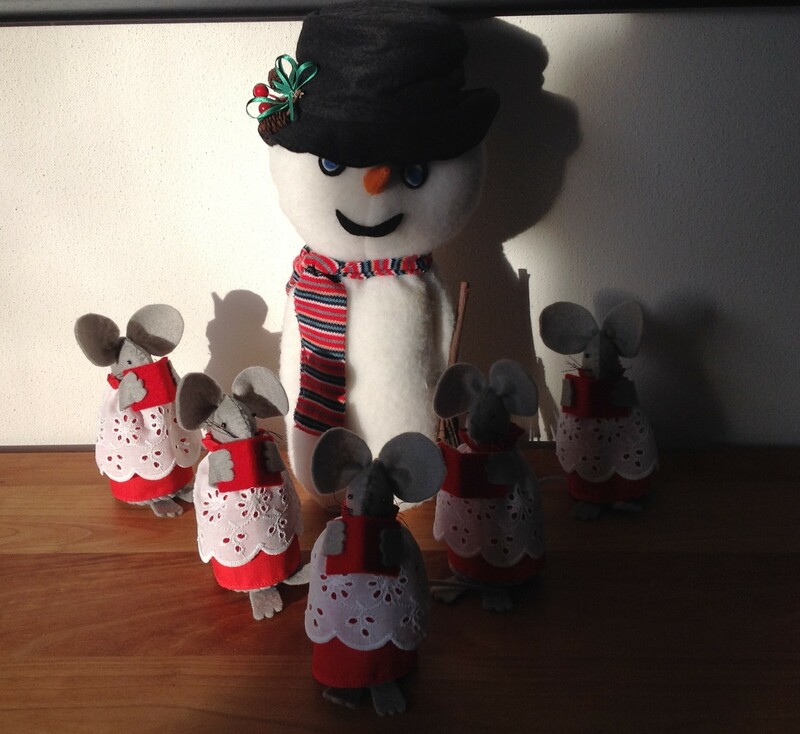 My love of making things at Christmas continued on down the years and a snowman made for my brother and his new wife in the 1970s went to America with them in 1985 and still reappears each year to be joined by a set of choir boy mice made by my sister in law. I have always found that America is the home of some really wonderful Christmas ideas and they do not underestimate the skills required by the makers. I made a ‘Santa of the Back Woods’ from an American pattern for my great niece and nephew sometime in the late 1990s whose pièce de résistance was a pair of little gold-rim spectacles definitely not available in the UK at the time. I wondered if he was still around today and I sent an email to Susan, my niece, to find out. I had to be very diplomatic and understanding in case he had been discarded long ago – but no he is still very much around and following a quick re-gluing of his beard I received a photo of him and it was just great for me to see him again. 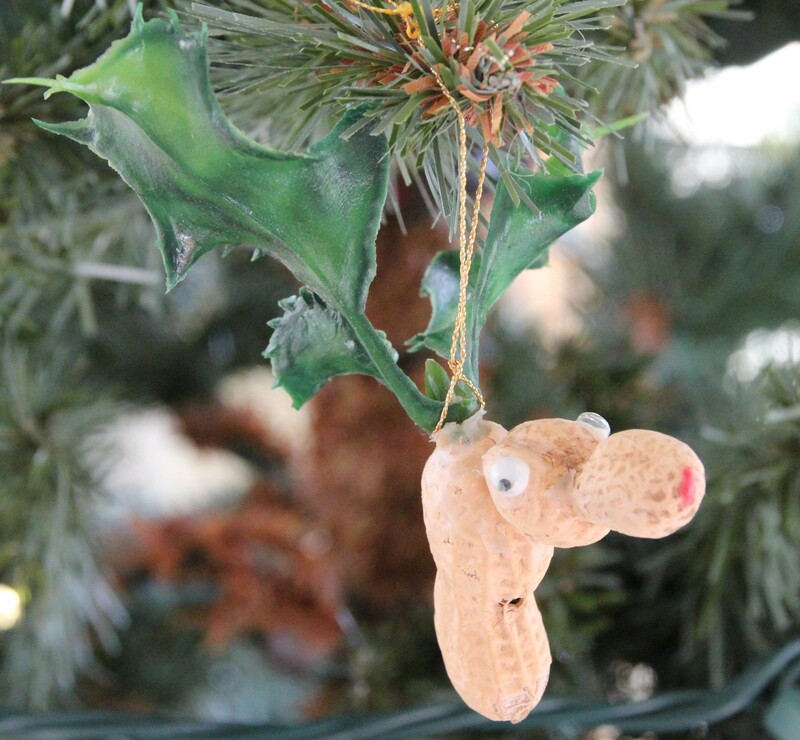 I leave you with a fine example of great all American know-how; Rudolf made out of a couple of unshelled peanuts and two holly leaves made at school by my other niece Elenor. 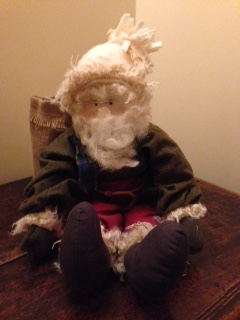 What a survivor he is as he must be getting on for 25 by now and still reappears to hang on the tree each Christmas! Please share your special Christmas memories as comments below, or, if you would like us to post your story with images, by e-mail – we would love to hear from you. This entry was posted in Uncategorized and tagged Barbara Elsmore, Christmas decorations, Dorset, Family History, Santa of the Back Woods, SDFHS. Bookmark the permalink. Happy Christmas and New Year to you Barbara and all at SDFHS. Thank you Carol and a very Happy Christmas and New Year to you too.